Cover potatoes with cold water by 2 inches in a medium saucepan. Bring to a boil; add 3 tablespoons salt. Reduce heat to medium-high; simmer potatoes until tender, about 8 minutes. Transfer to paper towels to drain. Bring another medium saucepan of water to a boil; add 2 tablespoons salt. Blanch snap peas until just tender, 1 to 2 minutes. Let cool in an ice-water bath. Drain, and pat dry. 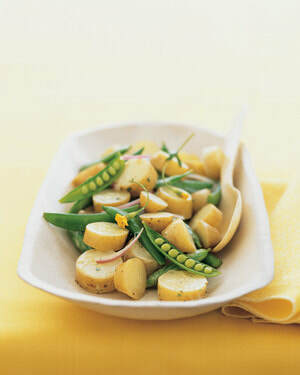 Toss potatoes, snap peas, onion, and vinaigrette in a bowl. Season with salt and pepper. Garnish with split snap peas, tarragon, and tarragon flowers, if desired.